Fujisawa, Japan - Panasonic Corporation is conducting a demonstration experiment of its Green Air Conditioner, which is a countermeasure against the heat island effect and provides comfort and respite from the heat in open spaces. The demonstration will be conducted in the Fujisawa Sustainable Smart Town* (located in Fujisawa City, Kanagawa Prefecture) to offer park and community bus users a temporary reprieve from the heat. The demonstration experiment will take place from August 1 to September 30, 2017. 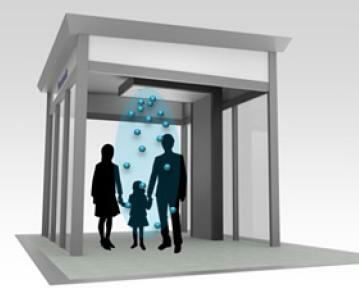 Panasonic will equip shelters for bus stops and rest areas provided by its partner, Sekisui Jushi Corporation, with the Green Air Conditioner currently under developing that creates a fine dry mist to examine the cooling performance in open spaces. Panasonic aims to bring this solution to market by the end of FY2018 after investigating the Green Air Conditioner-shelter combination's ability to mitigate effects of extreme heat and the receptiveness of users. "Green Air Conditioner - Shelter Type"
Examining the cooling performance and comfort at shelters for bus stops and rest areas. Panasonic's proprietary low-pressure driven double-fluid nozzle creates mist with superior evaporativity and cooling capability. Prevents the cool space created by the mist from being disrupted by the natural breeze that flows into the shelter. Extremely durable windproof panels and roof structure enables the shelter to maintain its beautiful appearance over a long period of time, and also enhances the effectiveness of the Green Air Conditioner. By retaining and evaporating moisture, the pavement prevents road surface temperature within the bus stop from rising. Continuing with last year's experiment, the "Green Air Conditioner Monument Type" is still installed in the open courtyard at the Panasonic Center Tokyo (Ariake, Koto-ku, Tokyo) to demonstrate the solution's durability.